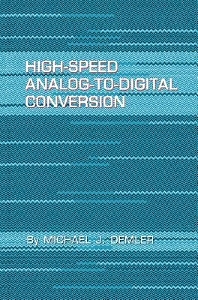 This book covers the theory and applications of high-speed analog-to-digital conversion. An analog-to-digital converter takes real-world inputs (such as visual images, temperature readings, and rates of speed) and transforms them into digital form for processing by computer. This book discusses the design and uses of such circuits, with particular emphasis on improving the speed of the conversion process and the accuracy of its output--how well the output is a corresponding digital representation of the output*b1input signal. As computers become increasingly interfaced to the outside world, "ADC" techniques will become ever more important. Electronics design engineers, particularly those in the military and computer-related work. A/D Converter Architectures. Looking Inside Flash A/D Converter ICs. Modeling Error Sources: High-Speed A/D Specifications. Support Circuits for High-Speed A/Ds. Flash A/D Applications. Test Methods for High-Speed A/D Converters. Bibliography. Index.